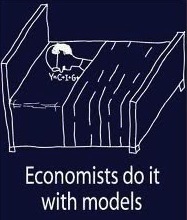 Ray Fair's model is here http://fairmodel.econ.yale.edu/vote2012/index2.htm You can make your own predictions. It's much more narrow in scope than Nate Silver's model. The Fair model, as I recall, is mainly economic indicator based. Silver has weighted adjusted poll results and economic indicators based on empirical work to establish the better explanatory variables and their appropriate weights. To be, um, fair, the Ray Fair model has been around for quite a while and part of its virtue is that long historical record. So what we're seeing is that the now-cast is flat, and there seems to be an absence of any convention bounce for Romney. Because the fore-cast has a factor in it which assumes that there should be a post-convention bounce which then decays it is starting to penalize Romney pretty harshly. It'll be interesting to see if Obama can pickup a bounce in the actual now-casts -- if those results are flat as well, it could just be evidence that swing voters just aren't being swayed by pageantry this time around and that the post-convention-bounce-model in the fore-casts aren't reflecting reality. Delighted to see someone paying attention to Nate's blog. The Now-cast is in fact up 1 percentage point during the RNC, so yet another anti-bounce. So both models tell the same directional story. As to which model is most appropriate, Nate discusses that at length today. My take is that if the current economic indicators and convention weight adjustments in the Nov 6 Forecast model are sufficiently strong to show that size trend (up another 1.1 percentage points since my original post) then we need to pay attention since they are wiping out any actual positive convention bounce by a large margin. What happens to these sophisticated models during the DNC - and after the Friday jobs report - will be fascinating.